In motoring news which may be of interest to people keen to save money in the current economic climate, it has been claimed people who change their driving style can significantly reduce the amount they spend at the pump. Organisers of this year's ALD Automotive/Total Excellium MPG Marathon state the event has shown avoiding sharp braking and accelerating can cut fuel costs by an average of 23 per cent. They point out if everyone in the UK adapted their behaviour behind the wheel in this way, a total of £8.2 billion would be saved each year. People taking part in the 2008 marathon undertook a round trip between Bristol and Macclesfield. Commenting on the findings from the event, organiser Ross Durkin said: "It's not what you drive, but how you drive that makes the difference." 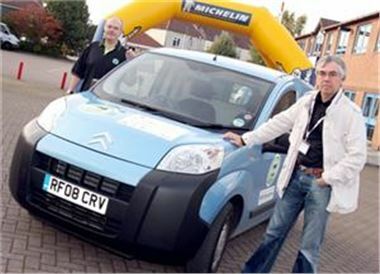 Meanwhile, the event found the Citroen Nemo to be most fuel-efficient van in the UK.